Slicing into the Atlantic like a dagger, Cabo Ortegal is one of the most recognizable spots on the rugged Galician coast. In few places in the community is the sea fiercer than it is here. With Herbeira’s impressive cliffs to one side and A Mariña, in the distance, to the other, it is the ideal place to contemplate the ocean and to reminisce over old seafaring stories. The easiest way to get to Cape Ortegal is to do it from Cariño, taking the road, well signposted, from the town’s centre. It can also be reached through the track coming from Herbeira, turning left at viewpoint of A Miranda’s junction. They are, in either case, narrow, twisty roads that should be approached with care and patience. It is worth it. The view from the top is a truly privileged one. To the east is the winding entrance of the Ortigueira y Ladrido estuary; several small rivers (the most important of which are the Mera and the Baleo) flow into this S-shaped inlet, shallow and abundant in sandbanks that form intricate canals and beautiful beaches open to the sea. 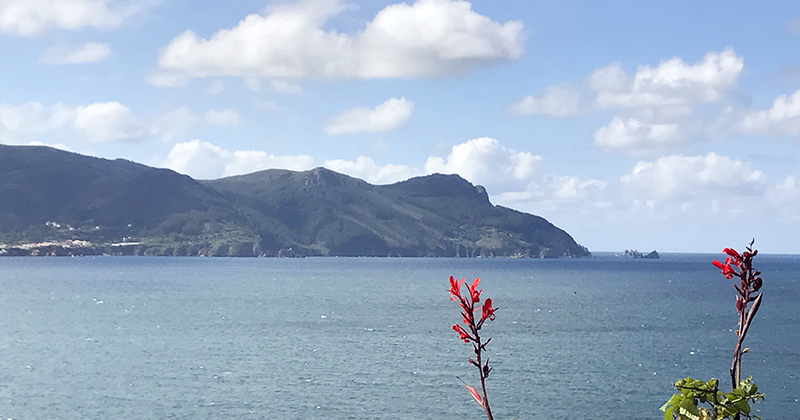 Further on stands the majestic effigy of Estaca de Bares, the cape that separates the Atlantic from the Cantabrian sea and which has so many similarities with Ortegal itself. Facing north lies the immensity of the ocean. Before that, closer to land, are the steep islets of Os Aguillóns. Their name, meaning “the stings”, suits them perfectly, because they are several small sharp islands where seabird colonies live and nest. Watching them fly is a guaranteed spectacle: soaring above air currents and touching the waves with their feathers, the birds challenge the force of both the tides and the wind, which blows here unencumbered. If you turn your gaze to the west, you will see the wild mountain range of A Capelada, populated by herds of semi-wild horses and cows, the highest point of which, the Garita de Herbeira, is one of the highest cliffs in Europe. In this area are several viewpoints, well signposted, from which you can get privileged views of the region. The lighthouse is located in an esplanade of modern construction that allows better views. It is a modern, cylindrical building, painted white and red, which signals this area of ​​the Galician coast, which is especially dangerous to navigate, to ships. Inland is the town of Cariño, capital of the municipality where Cape Ortegal is located. It is a town that grew much in recent years thanks to the heavy activity of its port, one of the most important ones in the Galician Cantabrian coast. In addition to the beauty of the landscape, Ortegal is a must see for geology lovers. The rocks on which the lighthouse stands are among the oldest in the Peninsula. Their geological name is amphibolite, and they are over a billion years old. They are dark rocks, rich in iron and magnesium.